If you’re asking yourself, “How much should I feed my cat?” look no further than the package. It has a wealth of information like ingredients, serving information and feeding instructions. This may not be the only place you need to look, but it’s a great start to determine how much you should be feeding your cat each day. If you have more questions than the package answers, go to your pet food's website. 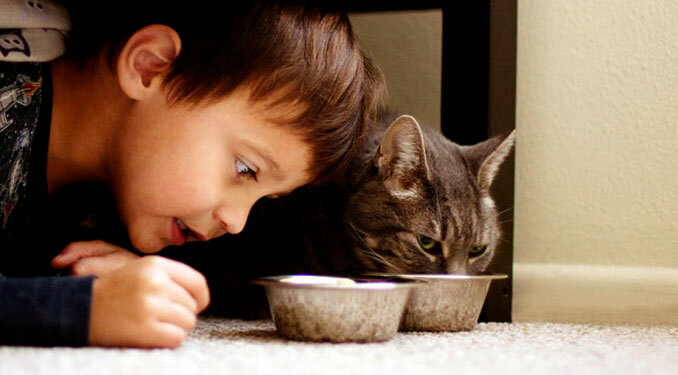 Many pet food brands have comprehensive websites that include a cat feeding chart or feeding guidelines, and even answers to frequently asked questions. Your veterinarian is a pet expert, so she knows how much to feed a cat. More importantly, your veterinarian also knows your cat’s personality and health history. Her advice will be based on specific knowledge about your cat and her diet. Talking with your veterinarian might be the best way to reassure or direct you on how to feed your cat. Life stage: A growing kitten has different nutritional needs than adult and senior cats. Breed: Genetics impact your cat’s body size and shape. Activity level: Every cat has a different personality and temperament. Some are sedentary while others are very active. Too much of a good thing, or overfeeding, can put your cat at risk for weight-related diseases. Likewise, underfeeding can negatively impact your cat's ability to stay healthy.